When I show up to an event or party and see queso dip on the table I get filled with an unexplainable joy. All I crave to do is spoon it into my mouth, however, that isn't the most appropriate thing to do at someone else's home. I created this easy queso recipe so I can do all the spooning I want in the comfort of my own home! What IS The Best Cheese For Queso? This wasn't my first attempt at making this quest dip. I originally tried it with cheeses that don't melt down and meld together well. So, as you can imagine it was a chunky, separated, but still cheese mess. I did some research the second time and found that most people use velvetta, but velvetta is higher in carbs than I'd like. This led me to cheddar. Cheddar is reliable, melts well and tastes delicious! I also recalled that Monterey jack has a subtle flavor and is also highly used in dips! Some other great options for melty cheese are fontina, parmesan, american and good old cream cheese. If you're making nachos check this l﻿﻿ist out! All The Best Dip Recipes Have Cheese! Whether you're using a chip or a spoon to shovel delicious dip in your mouth I think we can all agree that all the best dips have cheese in them. For example, this queso dip. We also have a buffalo chicken dip, spinach artichoke dip and pizza dip to satisfy your cheesy dip cravings! If you don't agree try making any of the above mentioned and I'll make a believer out of you. Cheese can be strong or subtle in flavor, adds a smooth texture unlike any other, and pleases most if not all people in the room. 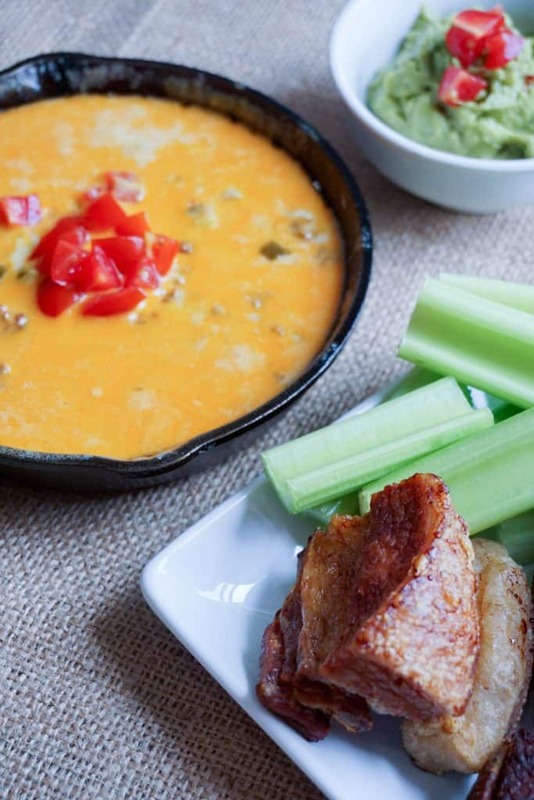 This is definitely one of those dips you'll wan't to make for game day or hosting some friends over. You can pair it with tortilla chips for your non keto friends and with celery, flackers, and pepperoni chips for yourself! 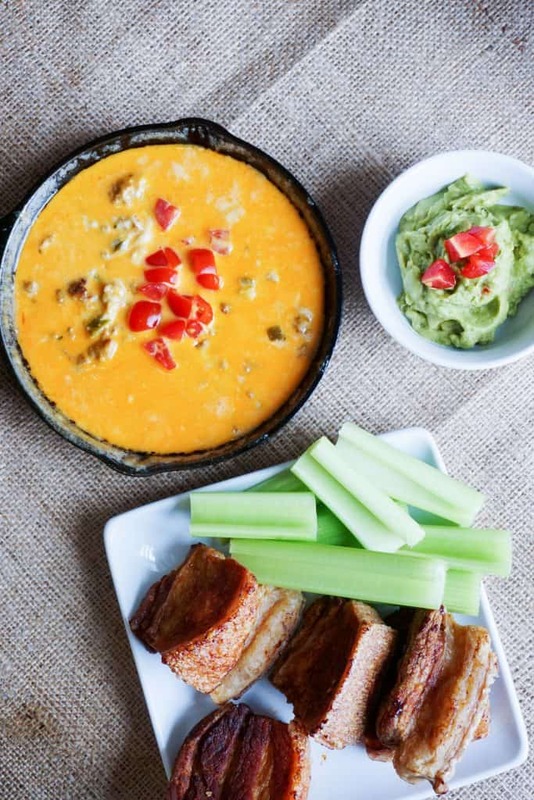 We created this easy queso dip to bring something new to the low carb appetizer table in under 30 minutes! 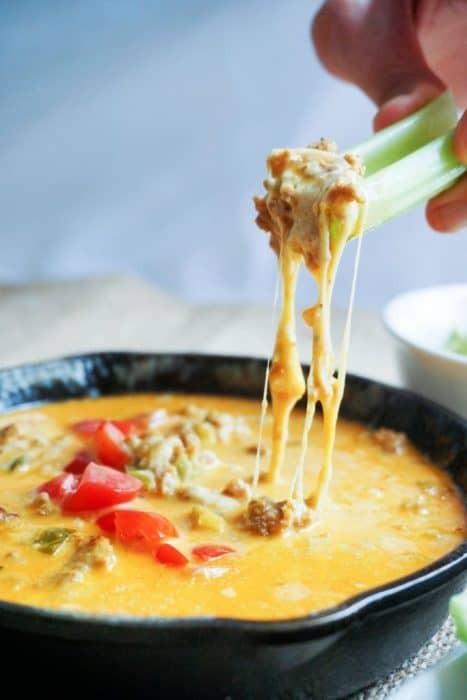 Recipe can be quickly added to MyFitnessPal - Search "KetoConnect - Easy Queso Dip"
Optional: If you are using chorizo, cook it in the skillet first and remove once fully cooked. Drain most of the excess grease. If you aren't using chorizo omit this step. If you bought the cheese in blocks, shred 4 oz of each and set aside. Add butter and garlic to a medium-low heat skillet and mix until fragrant - about 15-20 seconds (don't let the garlic burn). Add heavy whipping cream and combine. Slowly add in the monterey jack and white cheddar cheese while combining and ensuring the cheese melts until you add more. Allow it to heat through and combine as you continue to mix for a couple minutes. Add in salt and xanthan gum and combine. Mixture will thicken slightly. Dice jarred jalapeños and toss into cheese and combine. 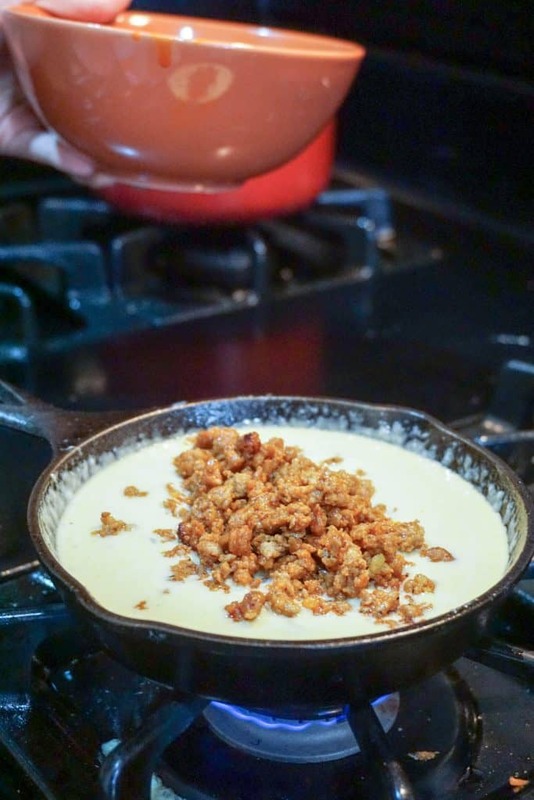 TIP: let it heat through until it's fully combined and resembles a queso dip - you'll know when it's done! No longer than 10 minutes at this point. OPTIONAL: At this point you can add the chorizo back in along with diced tomatoes if you opt to use it.